Dr Marco Gersabeck is an experimental high-energy physicist focusing on flavour physics. He works on the LHCb experiment at CERN's Large Hadron Collider and on the Mu2e at Fermilab. Since the start of data taking, Marco has played a leading role in LHCb's charm physics programme. 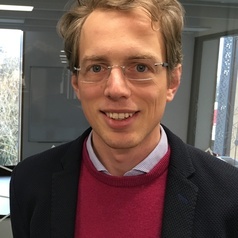 With the LHCb team at the University of Manchester, which he leads, he has a range of responsibilities in the operation of the current Vertex Locator and the construction of its successor.